Father James E. Arneson, a retired diocesan priest, died unexpectedly on Oct. 23 at his home in South Pasadena, Fla. He was 70. His last ministry assignment was as administrator and then pastor of St. Joseph and St. Ann parishes in Jennings County from 1973 until 1994. He was granted early retirement from active ministry for health reasons in 1994. The Mass of Christian Burial will be celebrated at 10 a.m. on Nov. 5 at St. Joseph Church in Jennings County. Burial will follow at the parish cemetery. Bishop Christopher J. Coyne, apostolic administrator, is scheduled to be the principal celebrant and homilist. Father Jonathan Meyer, pastor of St. Ann and St. Joseph parishes and St. Mary Parish in North Vernon, remembered Father Arneson as a very pastoral priest with a wonderful sense of humor. The priests enjoyed occasional, long-distance calls after Father Meyer was assigned to the three Jennings County parishes in 2008. “He was a very dedicated man to his flock,” Father Meyer said. “He gave himself tirelessly for his sheep pastorally, spiritually and sacramentally. Father Arneson founded the Four Corners Knights of Columbus Council #10422, Father Meyer said, and also paid for new roofs and air conditioning at St. Joseph and St. Ann churches. Deacon Michael East, a member of St. Ambrose Parish in Seymour and former district deputy for the Knights of Columbus, knew Father Arneson through his ministry with the Catholic men’s organization. Jennifer Arneson of Chicago, Father Arneson’s niece, said her uncle “was always thinking about his parishioners and family members, and always helping his neighbors. We had a lot of great tributes about how much he was helping a lot of people who are shut-ins and elderly in Florida. He had taken people to hospitals and done all sorts of nice things for people down there. James Edward Michael Arneson was born on April 15, 1941, to Edward M. and Gertrude (Lawhorn) Arneson, who were members of St. Philip Neri Parish in Indianapolis. He attended St. Philip Neri School, Holy Name of Jesus School in Beech Grove and the former Latin School in Indianapolis. After graduating from St. Mary’s College in Kentucky, he studied for the priesthood at the former St. Maur Seminary in Indianapolis. He was ordained to the priesthood by Archbishop Paul C. Schulte on May 7, 1967, at Saint Meinrad Archabbey Church in St. Meinrad. Father Arneson celebrated his first Mass on May 14, 1967, at Holy Name of Jesus Church in Beech Grove. His first assignment was as associate pastor of St. Joseph Parish in Shelbyville on May 23, 1967. On Dec. 1, 1971, he was appointed associate pastor of St. Mary Parish in New Albany. 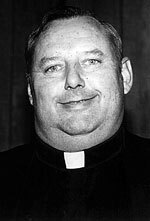 Father Arneson was named chaplain of the Knights of Columbus Cardinal Ritter Council #1221 in New Albany on March 6, 1972. On July 5, 1973, he was appointed administrator of St. Joseph Parish in Jennings County. He accepted an additional assignment on Aug. 9, 1975, as administrator of St. Ann Parish in Jennings County while continuing as administrator of St. Joseph Parish in Jennings County. On March 4, 1975, Father Arneson was named administrator of Our Lady of Providence Parish in Brownstown while continuing as administrator of St. Joseph and St. Ann parishes in Jennings County. Father Arneson was named to his first pastorate on Aug. 27, 1977, at St. Joseph and St. Ann parishes in Jennings County and Our Lady of Providence Parish in Brownstown. He ministered at Our Lady of Providence Parish until Aug. 31, 1977. Father Arneson continued to serve at the Jennings County parishes until he was granted early retirement on May 19, 1994, and moved to Florida. Surviving are a sister, Ann Bruce of Indianapolis, and several nieces and nephews.